Singing, and music in general, is a very subjective experience. Like many art forms, there is no simple formula for getting it ‘right’, because ‘right’ is different from performance to performance. There will never be a perfect performance, because perfection is an impossibility. There will always be something to be improved. Instead of viewing this as negative, re-frame this idea as positive. There will always be something to work on, some aspect of the performance to improve. The beauty of this is that there is no ‘finish line’, the work is never done. It also means that each performance can have a different quality, making each experience individual and unique. 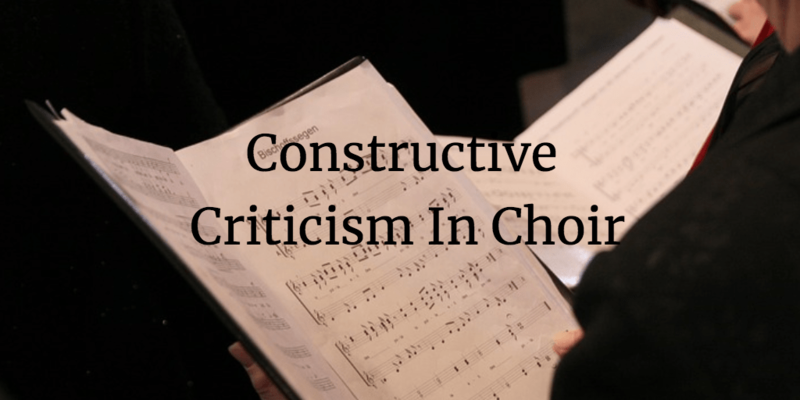 Because choirs are, by their very nature a group endeavour, constructive criticism is almost always delivered to the group at large, or by section. It is very rare, and frankly not entirely helpful for an individual to be singled out and criticized. After all, when the choir is successful we don’t praise individuals, we praise the group. The same is true for feedback. It can feel very true that there is safety in numbers, but there is something solidifying and unifying about receiving constructive criticism as a group – it reinforces the sense of team, and community, and also makes any criticism feel less personal, and more constructive. One of the best ways we have of learning is from our peers. When we sing in a choir we have the voices of many people around us to instruct us. Their feedback doesn’t even need to be conscious or spoken. If you can tell that your sound isn’t quite matching that of your peers, listen and adapt your sound to try and match. In the CCC we also teach theory, and use solfege to help our singers learn to sight read. All of our choristers are more than happy to help those around them, who may not have as good a grasp on music theory or solfege as they do. This sort of peer feedback is essential in making sure that we help one another to grow as a group! How else is constructive criticism delivered in a choral setting? Tell us in the comments below!